Declan Nurse, NSRI Knysna deputy station station commander, said: “At 14h38, Saturday, 27th June, NSRI Knysna duty crew were activated following reports of a surfer bitten by a shark while surfing at Buffels Bay, between Knysna and Sedgefield. “NSRI Knysna launched the sea rescue craft Jaytee III and our sea rescue vehicle with an NSRI medical team, including NSRI doctor, Dr. Grant Trollip, and WC Government Health EMS, ER24 ambulance services and All Sound Security responded to the scene. “A local doctor, Dr Dee Richmond, who happened to be on the scene at the time of the incident with her husband, initiated emergency medical treatment to 19 year old Caleb Swanepoel, from Prins Albert, who is a student at the University of Cape Town (UCT), who has suffered complete amputation of his right leg above the knee and lacerations to his left leg from a shark bite. “Fellow surfers and bystanders assisted the doctor until NSRI arrived on the scene. “Caleb had been rescued from the water by fellow surfers. “On arrival on the scene the NSRI medical team continued medical treatment to the patient who was conscious and in a serious but stable condition and he was loaded onto a surf board and carried to the parking area to an awaiting ER24 ambulance and paramedics assisted the NSRI doctor with emergency medical treatment to further stabilise the patient. “Metro Control activated the EMS/AMS Skymed helicopter which has airlifted the patient to the George Medi-Clinic in a stable but serious condition for further treatment. “Caleb is on a regular holiday to the area with his family. 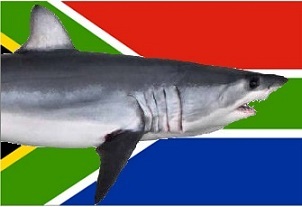 “With two shark encounters in two days along the Southern Cape Coast, yesterday in Plettenberg Bay and today at Buffalo Bay, NSRI are urging bathers and surfers to be cautious and to make an informed decision on wether or not to enter the water although it is advised not to enter the water in the area until Municipal Authorities advise further.